Chanalyzer and Cisco CleanAir - Do more from your desk! Leverage your Cisco CleanAir APs to troubleshoot from afar! With the optional Cisco CleanAir accessory for Chanalyzer, you gain immediate visibility into the 2.4 GHz and 5 GHz band from the perspective of your Cisco Access Points without leaving your desk. Being able to perform spectrum analysis from locations throughout your WLAN gives you a front seat to the action– whether it be down the hall, across town, or on another continent. 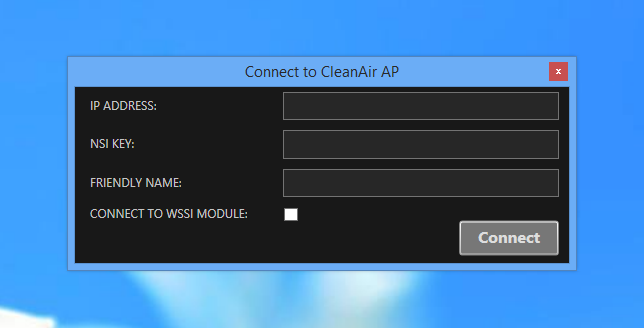 Simply put, the Cisco CleanAir Software Accessory is a license that allows Chanalyzer to connect with a Cisco CleanAir-enabled access point. Network Administrators can view 2.4 GHz and 5 GHz spectrum data directly from their CleanAir-enabled AP’s with Chanalyzer’s remote analysis capabilities. Chanalyzer lists and displays active interferers, and tracks channel information including Interference Max Power and Air Quality Index. Connect via a CCF file from Cisco Prime, or directly with an IP address and NSI key. Works with access points in Local, Monitor, or SE-Connect modes. Learn more about how to use the Cisco CleanAir Accessory here. Everyone's got to report to somebody. With just a few clicks using the Chanalyzer Report Builder Accessory, you can easily create a report that includes any or all graphs and tables displayed in Chanalyzer. Add your own pictures, create your own descriptions, or just use the defaults. After you’re done, export to PDF and present it to your client or boss. Never leave your desk with Chanalyzer + CleanAir!